The standard approach to explaining project assumptions is to start with the background details and end with a possible solution. But, most creatives are used to looking at this the other way around: it’s the conclusion that interests them the most, and they use it as a starting point for further discussion. This is quite the opposite to “design thinking” or “user-centered design” methods that start with understanding the context and building a detailed background for the project before beginning the design part. Although these are reasonable approaches that are supposed to make things easier, at some point they’re at odds with how creatives think about their work. Simon Veksner once recalled on his blog an interesting anecdote about the results of a Myers-Briggs personality test given to 500 creative directors — regardless of their personality type, all the creative directors had one common quality: the dominance of intuition over evidence. I’ve dug a little further into this story and found that it wasn’t an accidental result. Similar results from similar kinds of people occur quite often. Creatives are frequently more intuitive, which means that they prefer to use their gut instinct rather than logically reach conclusions. Intuitive types believe in novelty, in open-mindedness, and in never-ending improvement. They question why things happen the way they do. They also tend to be impatient with bureaucracy and rigid hierarchies, preferring to work informally with others as equals. ‘Sensing’ people gather evidence before reaching a conclusion. ‘Intuitive’ people come up with an answer first, and then look for evidence to back it up. Going deeper in the matter, we can find that according to a Mississipi State study, the leading personality type (based on the Myers-Briggs scale) for designers is INFP (Introvert Intuitive Feeling Perceiving). At the same time, a Strategic Aesthetic’s survey showed a prevalence of INTJ (Introvert Intuitive Thinking Judging) types among designers. Although the results of these two studies are slightly different (you can read more about it here), both of them are correct — because one thing you can be sure of is the complex personality of a creative… Which leads us to finding out how designers work. I loved the speech by Marty Neumeier showing the difference between the theory and practice of the standard design process. It shows not only a way of thinking that is common in all creative processes, but also points out how important it is to get constant feedback inside a multidisciplinary team. 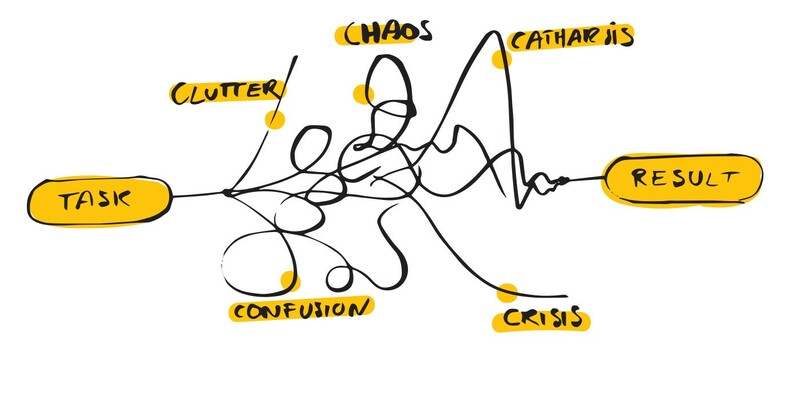 The “5 C” process shown in the image above is quite well known to all seasoned designers, although it’s not that obvious how to wriggle out of the creative chaos. Creative minds are mostly introverts: they prefer to work alone, solving problems and creating solutions. But they tend to forget that their concept isn’t disconnected and it needs to work for and with people. Therefore, it’s important for creatives to get constant feedback and to trial the concepts — not at the end, but throughout the whole creative process. It’s much better to know that you’re on the wrong track sooner than later — before working power drains away. So designers need to go out and play: talk, confront others with their ideas and hear what others have to say on the subject — not only creatives like themselves, but people with different points of view. And that’s the best moment to come to an understanding. So, how should we talk to creatives? Creative minds are mostly introverts: they prefer to work alone, solving problems and creating solutions without guidance from others. This is the essence of their creative process. Ask creatives questions. Although it may be annoying for them, it’s a good way to understand their concept and to find flaws in it. Creatives tend to work by jumping straight to the conclusion, but in the end, they’ll be happy to prove that their concept is based on facts and is substantive. Being a creative is equally hard as working with one — it’s the kind of work that often solves problems by creating different ones… Good communication in your team and the ability to solve those emerging problems is obligatory.